NO PROMS, GRADUATION, WEDDINGS, OR UNDER 25 GROUPS - PLEASE DON'T INQUIRE. NO NIGHTLY RENTALS - Full weeks only! OCEANFRONT - One of the best beaches on LBI- Brant Beach. Right in the quiet center of the island, but close to all the restaurants and fun. 52' frontage on ocean with private beach walkway, 2 decks and views up and down the coast. Reversed living - 1st floor has 3 bedrooms and full bathroom. Upstairs on the 2nd floor enjoy the open floor plan with vaulted ceilings plenty of room for everyone. Master bedroom with full bath. Updated kitchen with stainless and granite. 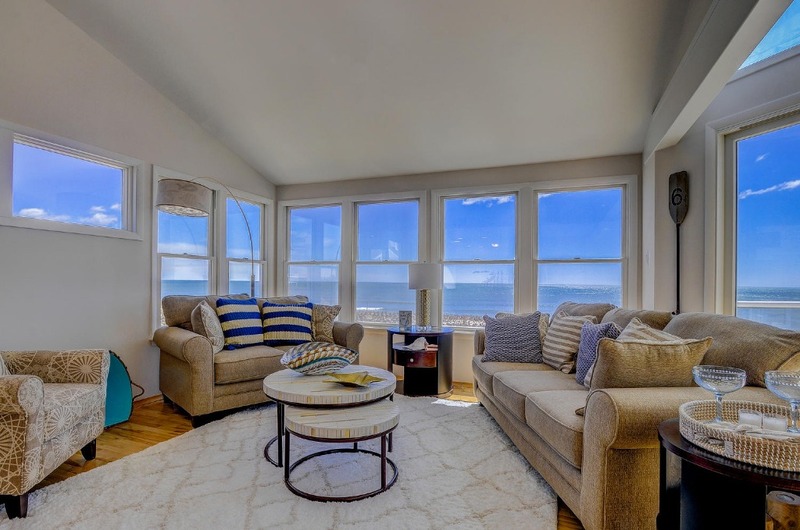 Beautiful hardwood floors reach across to full length windows providing all the sun possible and ocean views galore. Huge 2 car garage with washer/dryer and full bath for showering after a day at the beach. Room for all your summer toys. Plenty of parking for all those shore guests. It looks as good in person as it does in these pictures! Available weekly with a Saturday changeover. Price includes a changeover cleaning and linens & towels for 10. We are located on Ocean Boulevard, the road that runs right along the ocean that is popular for walking, jogging, and biking. Our home is located between 44th and 45th street right up from Daddy O's with panoramic ocean views from both INSIDE and outside from our second level deck! This home is raised and consists of three levels. The ground floor has our garage with storage for all your beach gear and is where our washer and dryer is located. The BEST part of our first floor is that it comes with a full bath! GREAT for quick bathroom breaks from the beach and the private shower is convenient for washing of the salt and sand! Four cars can be parked outside, in front of the garages. Up to the second level where you will find three of our four bedrooms along with a full bath. The oceanfront bedroom has a queen bed, the two other bedrooms on this floor have a queen bed in one bedroom and 2 bunk beds in the other. ALL of the bedrooms have linens supplied with plenty of pillows for a restful sleep after a long day on the beach. Also off the second level is a covered balcony, perfect for having your morning coffee or enjoying a good book ocean front, yet out of the sun. Up the stairs to the third level, main LIVING floor, where you enter the open floor plan with TWO sliding glass doors that open up to our south east facing fiberglass deck with ENDLESS ocean and beach views! This living area contains a wall full of windows to take in that awesome ocean view! Enjoy ocean views from the modern Kitchen with wood cabinets and granite counter tops with stainless steel appliances including refrigerator, range, dishwasher, microwave and wine fridge! It is well stocked with all you the equipment and utensils you need to cook and dine in. Also tucked away on the third level is our spacious Master Bedroom featuring a King size bed a master bath complete with linens and plenty of pillows to rest your head as the sounds of the ocean lull you to sleep. The master bedroom also features a 40" Smart HD LED TV. Want to take in the fresh ocean air? Two sliding glass doors open up to the third level deck with panoramic ocean and beach views. 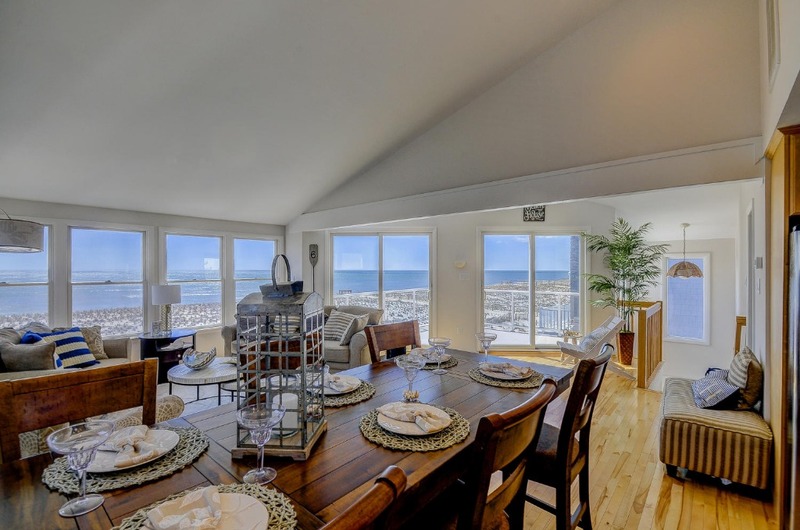 YOU CAN NOT FIND A BETTER OCEANFRONT RENTAL VALUE IN BRANT BEACH! ENTERTAINMENT/TECHNOLOGY - For inside entertainment, this unit features flat screen TV’s located in the living room, and master bedroom. We have xfinity cable TV by Comcast as well as high speed wireless internet so you can stay connected. With over 200MBS you can stream as much content as you desire! This property is a dream come true for my wife. We spent the first 8 summers of my children's lives vacationing in a house just a stone throw away from this location. Some day we dreamed of owning a little piece of this relaxing island paradise and in 2018 our dream came true! We like this area for its beautiful wide beaches, quiet family friendly neighborhood, and convenient, central location. Easy access on and off the Island is also a big plus and now we have the LBI Shuttle...what else could you ask for? Once you enter the top living floor, you will see why we chose this house. Watch the sun come up out of the ocean! Panoramic views of our pristine sugar sand beaches, with blue ocean waters. Then, when its time to go inside, relax with all of the comforts and conveniences of a modern home. There is nothing better than opening the windows and getting the ocean breeze and salt air smell inside the house. Except when its really hot and the AC feels just a little bit nicer. Park the car and enjoy your beach vacation down the Jersey Shore! Come over the bridge and make a right onto Long beach Boulevard. Travel about a mile and make a left onto 44th street, right before Daddy O's. Make your next right onto Ocean Blvd and our house is the second house on the left, oceanfront. Location- Our home is directly on the beach in a residential area. What does this mean? No streets to cross, or even walk on, to get to the beach! Walk out your ocean front door and follow our private path to the beach entrance on 45th street. Lifeguards are stationed at 44th street so you can swim right out front. Our residential location offers less crowds, less noise, more family friendly, and not a party spot. You walk out the door and onto the sand. 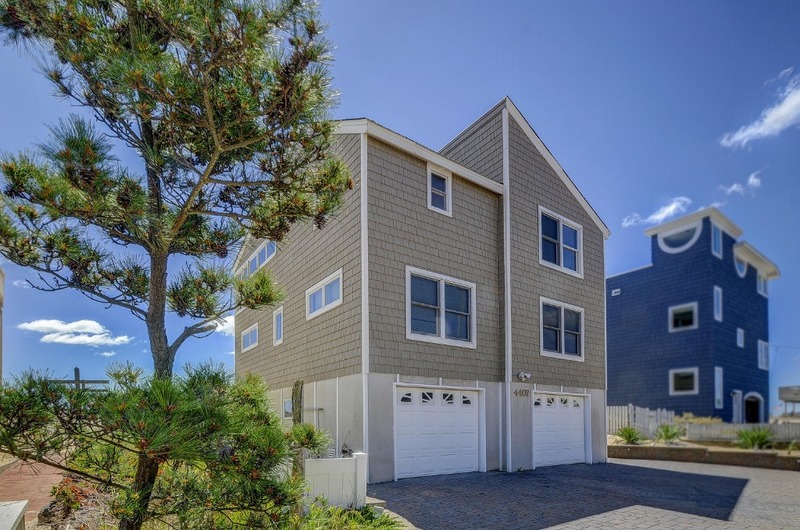 Besides being OCEANFRONT, you are also renting in a wonderful location on LBI. Brant Beach has some of the narrowest points on the LBI- the bay is just 2 short blocks away. This is great for sunsets and it’s a great walking community. Ocean Blvd is also comparable to a “boardwalk” in the sense that during the morning and early evening hours it’s frequented with walkers and cyclists. Everyone is happy and friendly; it has a relaxed island feel. A huge plus to renting here is that the beach is never crowded. What you find here is families. You are close to Beach Haven, but don’t have to deal with the crowds on the beach, looking for parking, or other beach goers sitting on top of you. Within a few blocks you have a handicap beach entrance (47th street), Daddy O’s (Restaurant & Rooftop Bar), Bagels & Beyond, Lucille’s Candies, and Dom’s Drive In. Also, within walking distance (3 blocks) from our home is St. Francis Church and Community Center. They have a beautiful indoor pool that can be used for a fee. 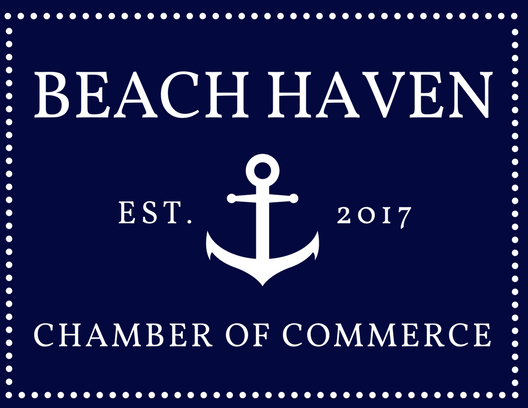 A short walk or bike ride away within one mile from our home is the town municipal complex-complete with tennis courts, pickle ball, basketball court, beach volleyball court, the Bayview Park and guarded bay beach. The Bayview Park offers special programs and weekly concerts throughout the summer. The bay beach is really nice to have on rough ocean days or with little kids who might be afraid of the ocean. Many people kayak, swim, paddleboard, windsurf etc. from the bay beach. Many businesses offer classes and equipment rental here. Hop on the LBI Shuttle and visit numerous restaurants as well as many places to shop, play mini-golf, rent boats, kayaks or bicycles, go crab fishing in the bay, charter fishing out of Barnegat Light and surf fishing on the beach. The island has an amusement park complete with rides, games, an arcade, and water park too! In the heart of Beach Haven is the Surflight Theater and the Showplace Ice-Cream Parlor. House , 2,200 sq. f.
Great house and amenities. Great beach access and views. Perfectly located on the Island. The owners do a fantastic job setting up and maintaining their rentals. Our stay at Listing #783 was fantastic. The house is directly on the beach--you're so close to the water it's like being on a ship! You have amazing panoramic views as you relax in the main living area. The house is meticulously clean, and linens and towels were provided for us (which was a much appreciated bonus.) The owner is very friendly and attentive and goes out of his way to make sure everything is perfect for your stay. My wife and I loved this home and are looking forward to renting again in the future. Duane and Kathy were flexible with our date requests - without which we woudl not have been able to have had such an amazing vacation. The house itself was gorgeous - very well decorated and extremely clean. Awesome view of the ocean! Our family would highly recommend. We loved every moment of our stay, the House was beautiful and so comfortable. The sunrises were amazing and the hosts could have not been more accommodating. It was a magical week!! This property and the owner were fabulous. The property was new and clean and the view incredible. The owner was attentive to booking questions. We had a great time and would book again. Had a fantastic week at Brant Beach Oceanfront. House was perfect, all details were considered and allowed for us to just enjoy and not worry about a thing. Great communication and processes allowed for a seamless experience. Just showed up and it was all taken care of. House is flawless and location is unbeatable. We spent the week of July 4th at this beautiful rental. Everything exceeded our expectations. Our trip was flawless from the time we booked our reservations until our departure. The furnishings were beautiful and the property was pristine and clean. The owners were wonderful to work with. I will definitely rent here again. We loved everything about this vacation. Perfect home in a perfect location! Fantastic Rooftop Views! Steps to the Beach!